If you enjoy playing pinball and consider yourself part of the growing group of pinball hobbyists, you may have considered—at one time or another—buying your own used pinball machine to play at home. And while you may believe that buying and owning a used pinball machine could be a costly and often complicated endeavor, you may just be surprised by how affordable and easy it can be. To help illustrate this point, in this article we have put together a complete guide for buying and owning a used pinball machine. This guide will include, among other topics, information on the cost for a typical used pinball machine, the various types of machines from which you can choose, some ownership considerations, and a how-to section on how to locate, buy and inspect your new pinball machine before taking it home. If you have made the decision to buy a used pinball machine, congratulations! Owning your own pinball machine can be an exciting and fun-filled experience, one that can save you hundreds of dollars in the long run if you currently play pinball at other venues. To help get you started, below we have provided answers to several important questions that may arise throughout this process. How Much Does a Used Pinball Machine Cost? Contrary to popular belief, buying a used pinball machine will not cost you an arm and a leg. In fact, in certain cases the cost of a used pinball machine can be outright cheap. Depending on the type of machine you select (we will discuss types of pinball machines below)—and how much work you are willing to do to it yourself—you can sometimes buy a used pinball machine for between $200 and $500. Machines this affordable are fairly rare, however, but if you spend enough time looking for a machine you may be surprised by the great deals you might encounter. In most cases, you can expect to spend between $500 and $2,000 for a “reliable” used pinball machine—a machine that works as expected. These plug and play machines rarely need any work, although you will have to maintain them to keep them working in good order. Spending $500-$2,000 may sound quite exorbitant, but when you compare those costs parameters to that of a new machine–$4,500-$6,000—you realize what a huge bargain you can get just by buying a slightly used machine. Here is the good news (or the best news): pinball machines tend to hold their value very well. In fact, pinball machines are a lot like automobiles in that collectors will usually pay more for an older, classic machine that has been well-maintained. Should you ever want to sell the used pinball machine you bought, you can usually expect to reap most if not all of the cost back, and in some cases the machine will even increase in value as the years go by. According to some pinball hobbyists, there are actually premium restorations of many pinball machines that consistently sell for $8000 or more. Many of these collectors list their machines as “rare,” but in reality there are only a few machines that could actually wear the “rare” tag—machines in which there was only a limited run of 300 or fewer machines. After purchasing a used pinball machine, you may have to perform some very basic maintenance on it to keep it working in tip-top shape. At minimum, you can expect to occasionally replace lamps or rubber rings. Fortunately, each brand of machine has a basic repair and maintenance manual, which, like everything else, can usually be found online. What Type of Used Pinball Machine Are You Looking For? Some people who are considering purchasing a new pinball machine may have their eye on a certain brand or make of machine, such as “The Adams Family,” “AC/DC” or “Fun House” pinball machines. This is all fine and good, but locating the exact make and model of a particular pinball machine can often be problematic and will usually take longer than you might expect. EM Machines. The EM machines, or “Electro-Mechanical” pinball machines, are the earliest types of pinball machines. These are relay-based machines that are controlled by a score motor and stepper units. This category includes all of the machines up until about 1978 when the SS machines began to emerge. SS Machines. SS, or Solid State, pinball machines are electronically-controlled machines that rely on microprocessors. These machines became available in the late 1970s and continued to be built until about 1990. DMD Machines. The DMD pinball machines, a term which stands for “Dot Matrix Display,” are solid state machines that also feature an animated display panel that is used for both scoring and low-resolution video. Most machines from about 1990 through the present have been of this type. One thing to know is that coils, lamps and switches are common to all three types of pinball machines. Also, the newer SS machines use easy-to-control micro-switches instead of the old leaf switches that were common in EM and earlier SS machines. The EM pinball machine is simple to play and learn, with thoroughly explained goals and a predictable sequence of hitting targets. When the SS machines came along they added an extra degree of reliability by replacing the relay logic with electronics and gradually expanded the goals players were forced to achieve. The complexity of the pinball machine was expanded over time with the addition of ramps, underpasses and a variety of theme-related content. This complexity continued to increase, to the point where newer DMD machines are sometimes referred to as Pinball “games” due to the complicated game play sequences and the playing modes they feature. 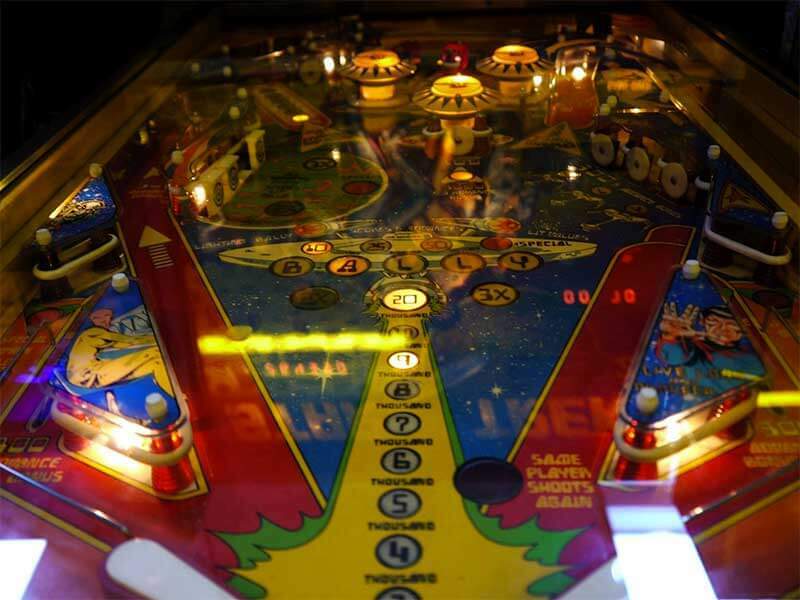 While EM games are usually easier for the pinball hobbyist to maintain, the other two types are usually much more reliable, as they utilize electronics that are designed to last a lifetime. Once you have determined your price range and the type of game you would prefer to own there are only a couple of other factors you will need to consider before making your purchase. First, you will need to consider where in your house the pinball will be placed. This is important because it will help you get an idea regarding the maximum size and dimensions for your new machine. Another important consideration is the weight of the machine—pinball machines typically weigh between 200-300 pounds. Because of this, you will usually need the help of a friend or two when moving the machine into the house. Finally, there is the noise output of the pinball machine. Pinball machines are quite loud since they’re designed to be used in a noisy bar or arcade environment. SS and DMD machines have an advantage here in that the volume can be turned down on these two types of machines. Buy locally. Buying from a local vender or collector is your best bet because you can view and inspect the machine before making a purchase. This will also save you on any shipping costs. Online Classifieds and Auction Sites. The internet auction site known as E-bay used to be a good source for purchasing a pinball machine, but due to policy and fee changes there are now a limited number of machines on the site and the prices tend to be sky high. Instead, you may want to turn to online classifieds that are dedicated to pinball—sites such as www.mrpinball.com and www.pynball.com. You can also place a wanted to buy, or WTB message on pinball forums and newsgroups, such as rec.games.pinball.com. Pinball shows. Pinball shows are a great way to find a used pinball machine that meets your needs. These are typically held in large cities so you may have to travel a bit to attend one of these shows, and remember to bring a truck just in case you make a purchase. Finally, you do not have to be an engineer or computer specialist to inspect your new pinball machine prior to making a purchase. Fortunately, there are only a few parts on a pinball machine that are difficult or nearly impossible to replace, but one of these parts is the back glass portion of the machine. For this reason, it is imperative that you carefully inspect the back-glass portion to ensure there are no cracks or dings that could possibly get worse while transporting or playing the machine. Back-glass replacements, assuming you can find a company that makes the glass for your particular machine, can often cost over $300, so if there is a back-glass problem on the machine you are inspecting you may want to move on to another prospect. Before purchasing a used pinball machine you should ALWAYS turn the machine on and play a game or two. While doing this, you can perform a series of visual inspections, beginning with things like video and audio; the action of ramps, targets and other goal related inserts; lights and lamps; flippers; bumpers; and more. Last but not least, when performing your inspection please keep in mind that parts like lamps and rubber seals are relatively cheap and easy to replace. However, parts like the aforementioned back-glass, computer parts and peripherals, and inserts like ramps and targets may be difficult to find and expensive to repair or replace.